For those who don’t know, l’Eroica is a ride in the Chianti region of Italy with simple rules: Your bike has to be pre-1987, in particular with brake cables running externally from the hoods and no clipless pedals (although both started to make inroads slightly before 1987). However, that simple premise doesn’t even begin to explain what l’Eroica really is: it may very well be the purest celebration of everything that is great about cycling. The bikes you see range from beautiful to stunning to interesting to weird, while the people are wonderful and the outfits nostalgia-invoking. Add to that a route on Chianti’s famed strade bianche, the gravel roads that dissect the vineyard-covered rolling hills, and you’ve got cycling heaven. Riding my late-70’s Gargiulo (a small Napoli outfit) makes me realize technology has come a long way. Its brakes barely slow me down even with the greatest effort. The frame stiffness is negligible. The smallest gear of 39×23 – compact cranks are still over a decade away – is a challenge on 20% gravel inclines. But the 30rpm cadence that results is wonderful, my whole world narrows down to the next 180 degree turn of my cranks, and the next, and the next, until eventually, the hill is crested. Only to have the relaxation instantly extinguished by the terrifying – equally steep and poorly surfaced – descent on the other side. The only invention I truly start to appreciate is index shifting. It’s easy to forget how finicky shifting used to be, with slipping gears quickly leaving me with only four options (big ring or small ring and biggest cog or smallest cog). I am not sure if there’s a statue in Japan somewhere for the engineer who invented indexed shifting, but there should be. Riding in wool shorts with barely a chamois may sound like hell, but it is remarkably comfortable. At least it was for me, and in combination with my Brooks saddle. I am seriously considering putting that Brooks on my regular road bike. Cycling history is so incredibly rich. Walking through Gaiole before the race and looking around during it, you see so many beautiful bikes, from 1920’s single-speed racers to firefighter bikes (with the hose rolled up inside the front triangle) and from the earliest derailleur models to 1970’s Giro-winning bikes. Together with all the vintage apparel, it’s a wonderful rolling museum. One of the highlights of l”Eroica are the rest stops. The first one serves water, wine and breads with marmalade, sugared win spread or olive oil & salt. Slightly apprehensive at first, I finally try a slice with the oil & salt and it is amazing. This may very well be the best sports nutrition on earth. I was a bit hungry on the stretch before the stop, so I go all out and probably eat 15 slices. “It’s delicious AND nutrition”, as they say. As I want to leave the rest stop, a guy in a yellow jersey walks by. In any other event, wearing a yellow jersey will get you ridiculed, but here even that is tolerated. Especially since, uhm, the guy is Pedro Delgado and he’s wearing an original. By now I’ve lost all sense of distance, and of course there’s no computer on the bike. I also didn’t bother to check at what distances these rest stops are, but rather than a problem, this state of mind is a wonderful experience. After a nice descent and long climb we hit a tiny town that has decided to organize its own “bandid” rest stop. Here, wine and sausage is on offer. I had resisted the wine at the first stop, but following the “when in Rome or close to it” adage, I give it a try. The wine is alright, although one sip is enough. The sausage is another story, the greasiness makes it possibly the worst thing I have ever eaten on a ride. The climb before the final rest stop is a killer, the surface is rutted and it is so steep that most people walk up it. Just to get the full experience, I do too. It’s a long walk but well worth it, at the top we are treated to a very nice Ribollita, a bean stew. Not your first choice on a ride maybe, but wonderful. So if you’re interested in doing l’Eroica, register early. If you want an all-organized trip (including the use of a historical bike), there are several outfits. InGamba from my good friend Joao Correia (ex-Bicycling publisher and ex-Cervelo TestTeam rider) is one, and Google Caffe Gruppetto for another one popping up in a few months. This entry was posted on	March 8, 2013 at 14:30	and is filed under Year of True Cycling. registration is closed… draw was march 3rd, I don’t get to start, you do, congrats! Ah, memories… but there WAS indexed shifting before the engineers had their brainwave: when you ride with those old shifters every day, your fingers get to know intuitively exactly where the gears are, give or take a minor adjustment for chain noise. Mind you, I love the convenience of shifting without having to move a hand! But you are so right about the brakes, as I discovered going down a windey 13% slope with a Yak trailer in tow (or pushing, in that case!) a few years ago. Hand cramps! Gerard, you sum up the overall experience well. L’Eroica in 2011 was one of my favorite days on the bike, period. One has to experience it in order to truly understand it, and if your ride too fast, you miss much of the experience. It may be the greatest way of ending the road season. I look forward to returning one day. One of your best pieces Gerard. A great little story. I agree totally, this event reminded us of why we took up cycling in the first place. We’re working on proper “bici d’epoca” now for this and other events like it which are popping up all over Italy. The concept of the retro-ride has really taken off in Europe and I am registered in ones in Germany, Holland, Belgium, France and, lottery winner that I am, Italy for l’Eroica in 2013. The atmosphere is really relaxed compared to timed events. 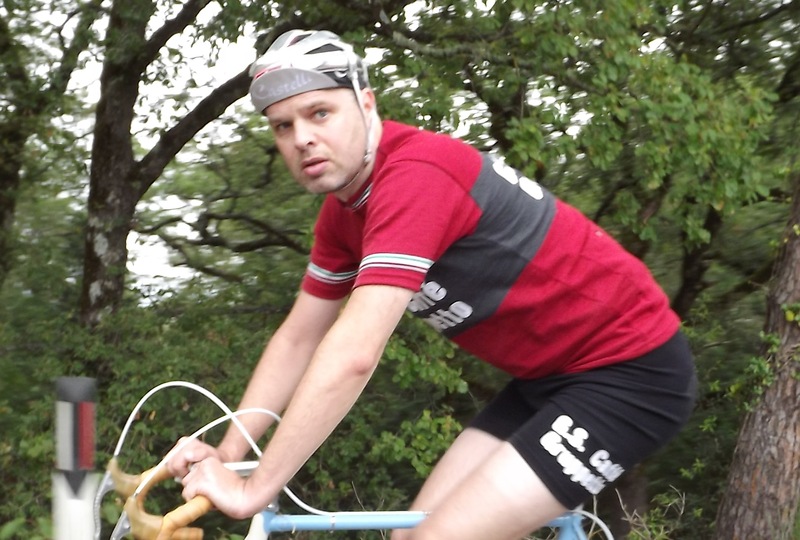 My experience at the 2011 edition of l’Eroica was great but I do not find friction shifting (I was using a Peugeot PXN-10 with SImplex Super LJ shifters) to be nearly as much of a problem as the pathetic brakes (Weinmann, in my case). The other thing I like is that you can have a lot of fun for not much money invested in an old bike but prices are rising here now.